California is the birthplace of many iconic dishes and drinks, from cioppino to mai tais to the fortune cookie. So The California Report Magazine decided to look into the origin stories of some of those classics with a new series: Golden State Plate. 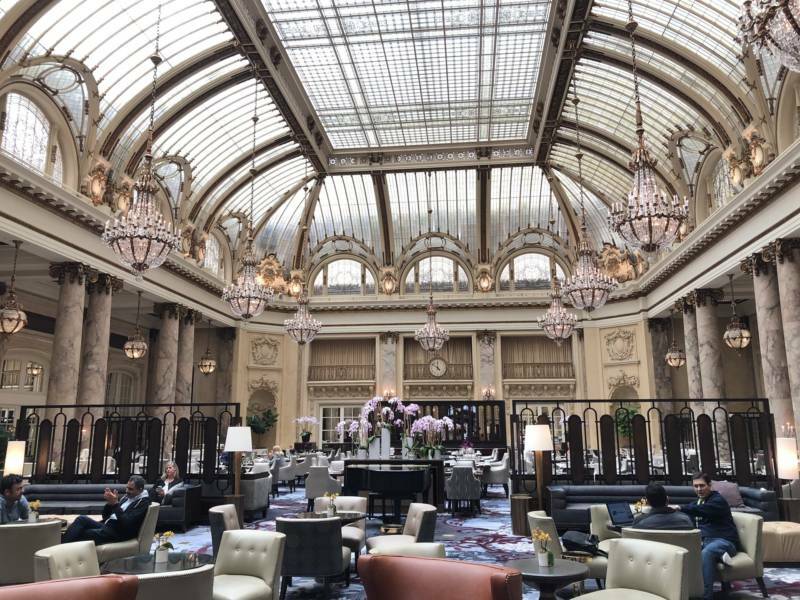 he Palace Hotel in downtown San Francisco is historically notable in a number of ways, including as a place where a sitting president of the United States died. It's also the birthplace of a famous California recipe: Green Goddess Dressing. You've likely seen the dressing on the shelves at the grocery store, but you may not know the story behind the condiment. 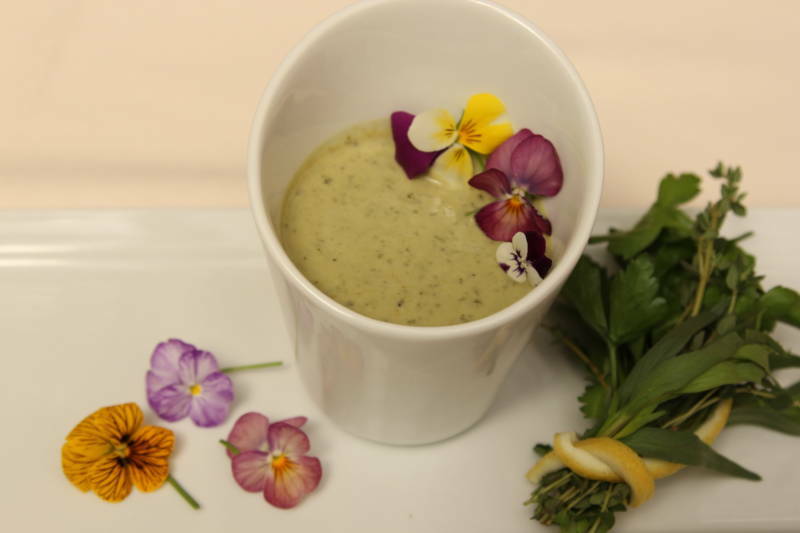 Two people who do know a lot about Green Goddess Dressing are Renee Roberts, who's worked with the Palace Hotel for more than 20 years, and Laura Borrman, author of the new book Iconic San Francisco Dishes, Drinks & Desserts. I met Roberts and Borrman at the Palace's Garden Court Restaurant to try some of the famous dressing at its birthplace. "Sitting here makes you feel sort of automatically connected to history," says Borrman. "I think about all of the other people who have sat at these tables." Roberts agrees: "There's a lot of history here... A lot of people have been through these doors." 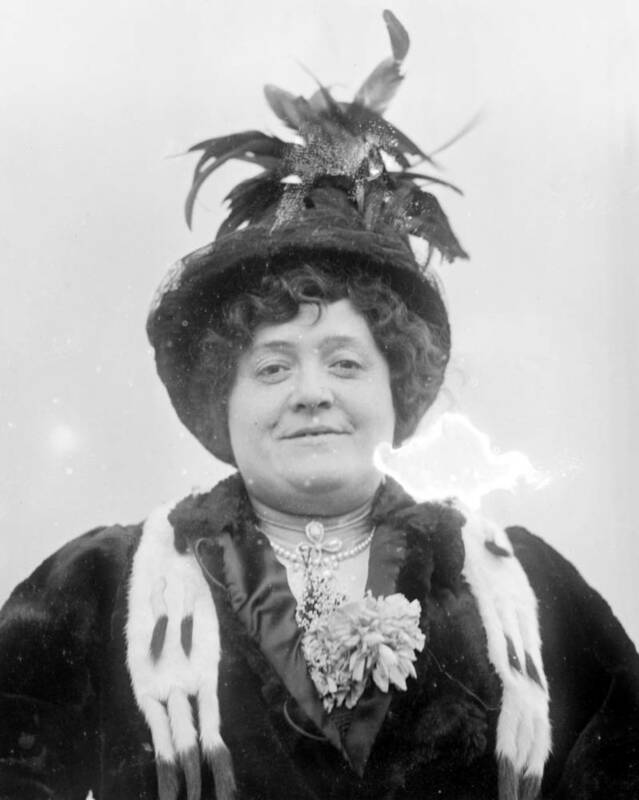 This hotel, back in its day, was a place where lots of well-known and wealthy people stayed, like opera star Luisa Tetrazzini. The hotel claims to have invented turkey tetrazzini, named after her. Likewise, Green Goddess Dressing was inspired by another star guest: George Arliss. 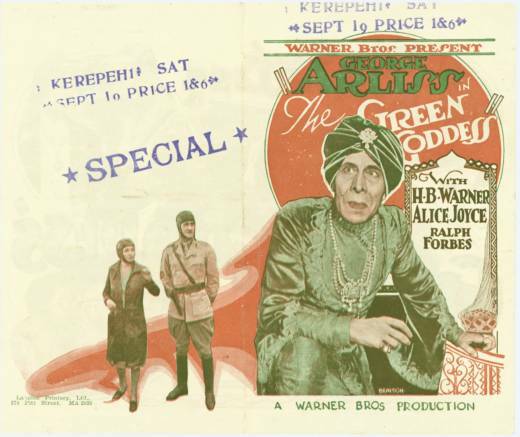 Arliss was the lead actor in the 1920s play, The Green Goddess. 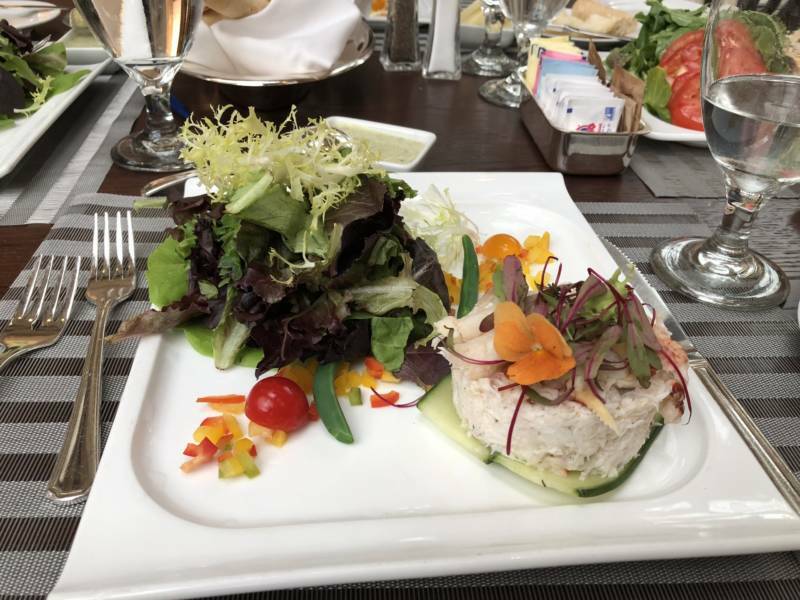 While he was staying at the Palace Hotel for a performance, Head Chef Philip Roemer created the special dressing to be served on the starter salad — and the rest is history. "It is a favorite," Roberts says. "There was a point when someone thought they could change it, and took it off the menu. It lasted for like a day." "We can't ignore how there's something really enchanting about the phrase 'The Green Goddess,'" says Bormann, who loves the dressing so much, she served it at her wedding. "If you wear a green dress to work, everybody's calling you the green goddess," Roberts laughs. "It's just kind of a thing around here." So how do you make Green Goddess Dressing? 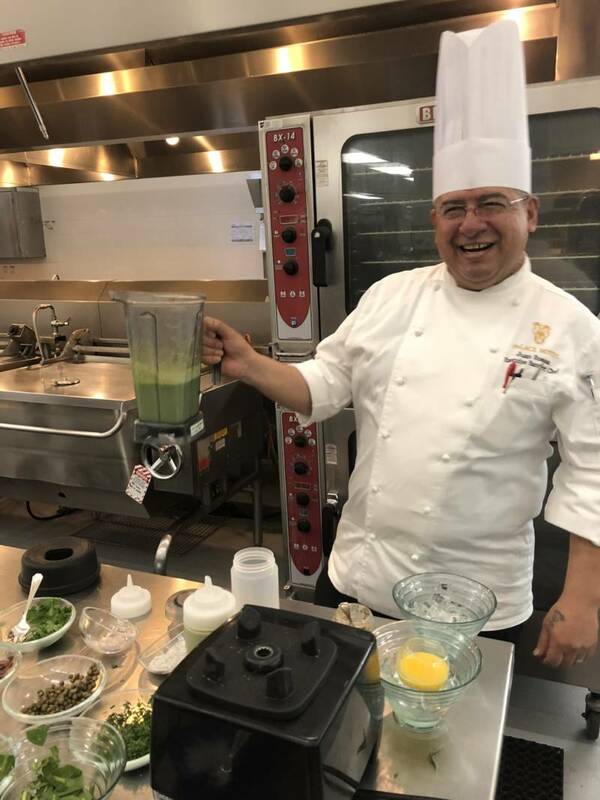 In the kitchen, Executive Banquet Chef Juan Rojas throws all the ingredients in a blender: ice, pasteurized eggs, whole grain mustard, shallots, capers, chives, spinach, fresh tarragon, chopped parsley, tarragon vinaigrette, salt and pepper, some olive oil and lemon juice. The result is a tangy, bright green dressing that is a far cry from the original invented in this kitchen almost 100 years ago. 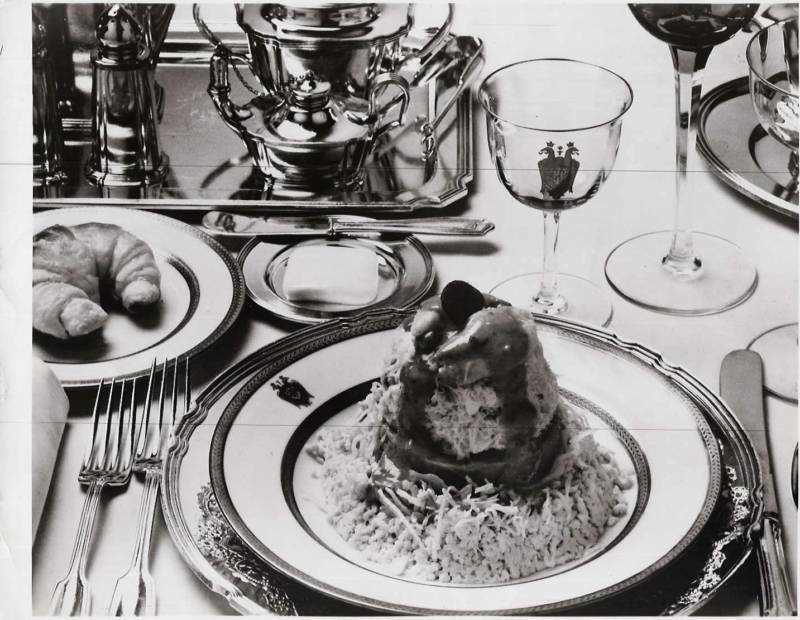 According to Roberts, the original recipe was heavy on the mayonnaise, and was served on a canned artichoke, considered a luxury in those days. Today, the Palace has lightened the dressing with olive oil. And there are no canned vegetables in sight. So what about the dressing's namesake? What exactly was the Green Goddess? After the play finished, two film versions of The Green Goddess were made. And in them, Arliss — a white British actor — starred as an Indian maharajah. All of the other actors were white too. They faked horrendous Indian accents. The film portrayed some of them as savages running around in afros, waving swords. And the Green Goddess? She was a made-up deity in a bad Hollywood version of a Hindu temple. It’s honestly kind of a blow to me. I love this dressing. I grew up thinking of it as hippie salad dressing, seeing it in the health food store, throwing it on my salads with sunflower seeds and carrots. But my family is Hindu, my dad is from India. And this racist movie from nearly 100 years ago is straight-up worse than Apu on the Simpsons. Sometimes digging into California food history isn’t so savory. But Green Goddess is a California classic because of the things that make it so Californian: the fresh herbs, an obsession with Hollywood celebrity, and simply how good it is. I’m still trying to work through the fact that something so seemingly innocent as salad dressing can carry baggage when my salad arrives: a big mountain of crab on a bed of shaved zucchini on one side of the plate, some greens on the other and a gravy boat full of electric green dressing. It's hard to deny: the dressing is really good, despite the problematic origins of its name. Both Borrman and Roberts describe it is as being "so Californian." And they're right: the dressing is clean and bright. It's herbaceous and tangy. Combine all ingredients (except oil) in blender or in container using immersion blender. Blend on high until smooth. While blending, slowly drizzle oil into mixture. Keep drizzling until oil is gone, then season with salt and pepper to taste. This recipe is for a one gallon batch of dressing. Can be stored in refrigerator for up to 10 days.